Termite. A Java library for the selective “Lambdafication” of applications. “Lambdafication” is the automated transformation of source code to make it run on AWS Lambda. It is a provider-specific flavour of generic “FaaSification” which is our ultimate research goal. With our Lambdafication tooling, we offer application engineers today the possibility to step into the serverless world without much effort, and leave the more challenging research tasks for the summer time. Continuing the Java Lambdafication topic, started with the Java translation tool for AWS Lambda called Podilizer, we inform about the open source launch of Termite, a buildtime/runtime library for Lambdafication. And here is logical question: “Why do we need another tool which essentially does the same job as Podilizer?” The reasons come from experience we gained prototyping, developing and field-testing Podilizer. One of them is the quality of translation of some complex projects (Java OOP/functional programming paradigm issues). Another one touches the code design: FaaS does not position itself as a new full cloud deployment method, furthermore native design of serverless fits the idea of going along with other projects and infrastructures. We assume that functions could take care about particular tasks in the cloud or become a glue between existing microservices. Based on this knowledge we created Termite, which tends to fit current FaaS paradigms by letting application engineers choose which methods to export. Unlike Podilizer, which is implemented as command-line tool and unconditionally translates a whole project’s source code, Termite’s design allows to translate certain methods into Lambda functions. It provides syntax elements to mark methods in your project and have them translated and uploaded as lambda functions in a controlled way. Not a less important advantage of Termite is auto-generating dependencies for each function, leading to easier configuration. On the other hand, Podilizer is able to handle between-functions calls, while Termite does not give you such opportunity (yet). Overall Termite looks more harmonious and flexible compare to Podilizer despite the limited maturity. Annotated methods are being processed over the compilation phase. 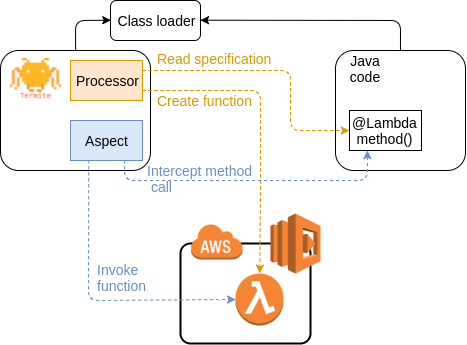 The Termite processor creates Lambda functions based on the particular method specification and uploads them to the cloud. Function invocation is performed through the AspectJ library. AspectJ interrupts the runtime workflow and calls deployed Lambda functions instead of local methods, as shown in the following high-level diagram. Afterwards, Termite is ready to be used within your Java application. Assuming you use Maven, create your own Maven project and configure dependencies. In case you use another build system, Termite does not offer integration yet but we are happy to accept patches of course. Afterwards, you’re ready to go serverless! Annotate functions you want to upload with “@Lambda”, see the example above. Maven will inform you about deployed functions which are then ready to be used from AWS Lambda. We’d like to hear from your experience with using Termite – do not hesitate to comment on this post. This entry was posted in *. * and tagged faas, java, open source, serverless, tooling by dord. Bookmark the permalink. Its very basic.. its help me a lot..
but i want to ask you about Polymorphism..
did you have an article about it?? Is this concept is new in java or what. Because i heard frist time about this. Graet that i find this article. With our Lambdafication tooling, It offer application engineers today the possibility to step into the serverless world without much effort. Wonderful article for the deatil understanding. Looking forward to see the next post. Looking great work! I really appreciated to you on this quality work. The article contains detailed information about selective Lambdafication and for me it’s really easy to understand. Thanks for sharing this concept. keep up the great work!